Traxxas Gets a Cover Shot « Big Squid RC – RC Car and Truck News, Reviews, Videos, and More! 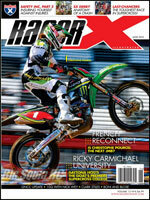 Traxxas sponsored motocross dude, Christophe Pourcel, is on the cover of the new RacerX magazine with the Traxxas Logo clearly seen on his helmet! Again, congrats to Traxxas for helping get their name and the world of RC to the mainstream! I’m starting to sound like Cubby! For more info check the Traxxas Website.